Did you know that the intellectual property of your business may be one its most valuable assets? Do you know what intellectual property is most important to protect? Are you looking for ways to expand your revenue by licensing your intellectual property? Do you have a great business name, logo or photograph that you don't want anyone to steal? Make sure you properly protect the trademarks and copyrights of your business. Flat fee pricing, contact me today! Think that because you've registered an LLC you now have a trademark? False. Discover someone else using your business name, so you're going to register a trademark ASAP to freeze out your competitor? That's not how it works. 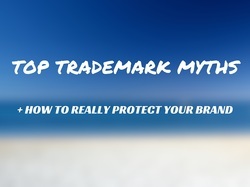 Find out why these are false trademark myths and how you can really protect your brand in my free webinar. Register now by clicking on the image above or HERE.